location: 386B Physics and Atmospheric Sciences Bldg. My main research is on Effective Field Theories (EFTs), in particular their applications to problems at the interface between particle and nuclear physics, and to problems in molecular physics. EFTs separate the energy scales in a physical system, and use their small ratios as parameters for controlled expansions of low-energy observables, even in the presence of strong interactions among many bodies. Nuclear systems are particularly interesting from a theoretical perspective as they require selective summations of terms in these expansions, while plenty of data exist to confront the theory. the low-energy theory --constrained only by symmetries, in particular chiral symmetry-- is used to systematically construct amplitudes involving nucleons in terms of parameters encoding the QCD dynamics, which are fitted to experiment. 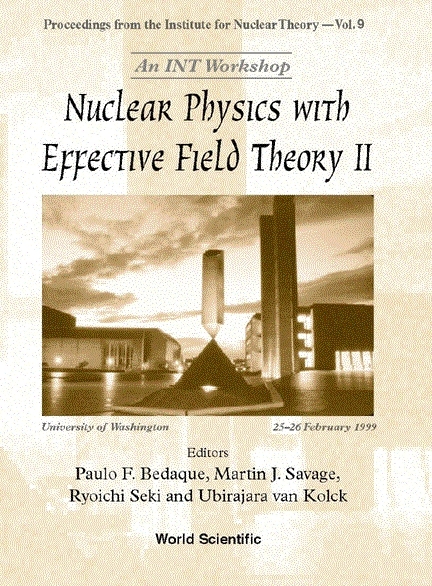 An extensive review of this effort is Effective Field Theory of Nuclear Forces , while a shorter one is Recent Developments in Nuclear Effective Field Theory . attempts are made to derive these parameters from QCD using constraints from Regge asymptotics and the large-N limit, in the context of both chiral quark and resonance models. For a lucid discussion of the philosophical underpinnings of this approach, see S. Hartmann's article. A particular aspect of my work --charge symmetry breaking in pion production-- has been highlighted in Science News, Nature Science Update, CERN Courier, and Physics World. (If you are open-minded, check out also SciScoop.) It was rated the #49 top science story in 2003 by Discover magazine. More recently there has been a story on time-reversal violation in the deuteron in Waves and Packets and Space Daily. This research program has been selected for an Alfred P. Sloan Research Fellowship, and also for an Outstanding Junior Investigator Award in the Division of Nuclear Physics of the Office of Science, US Department of Energy. In 2004 I was elected Fellow of the American Physical Society. More about my research can be found in my summary of research interests, and, of course, in my papers (inSpire citation summary, Web of Science citations). This is part of a broader research program in the U of A Department of Physics. Nuclear EFTs have become quite a popular field. 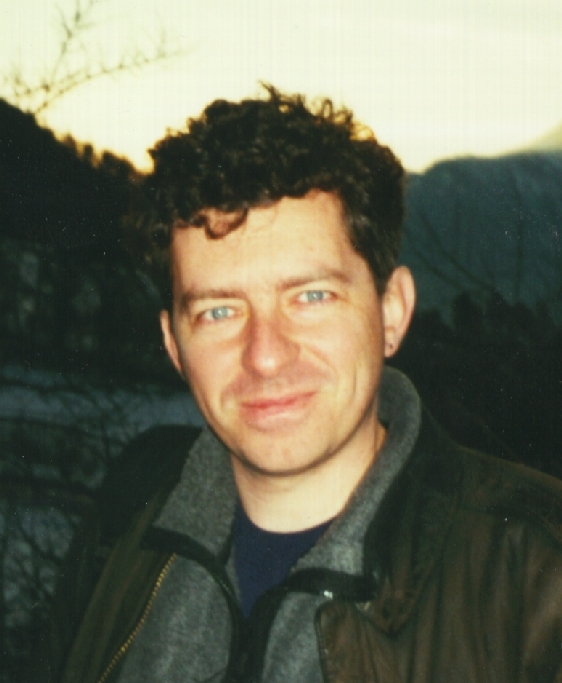 Early on, we organized two specialized workshops: Nuclear Physics with Effective Field Theory, held at Caltech in February 1998, and Nuclear Physics with Effective Field Theory: 1999, held at the INT in February 1999. Proceedings of both the first and second workshops have been published by World Scientific. 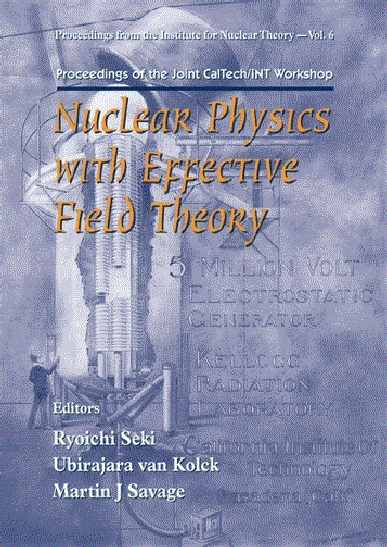 They offer a good sample of the basic developments in nuclear EFT. Many other meetings on EFT-related issues followed, including the epic The Nuclear Interaction: Modern Developments at the ECT* in the summer of 1999 (pictures!) and the much longer INT Program on Theories of Nuclear Forces and Nuclear Systems in the Fall 2003 (pictures!). The most recent meeting was the KITPC Program on Effective Field Theories in Particle and Nuclear Physics in August/September 2009. Nuclear EFT is now part of mainstream Chiral Perturbation Theory, and is gradually being understood, and thus accepted, by nuclear physicists. Institut de Physique Nucleaire, from Jan 2012. Some of my past talks can be found on the web. 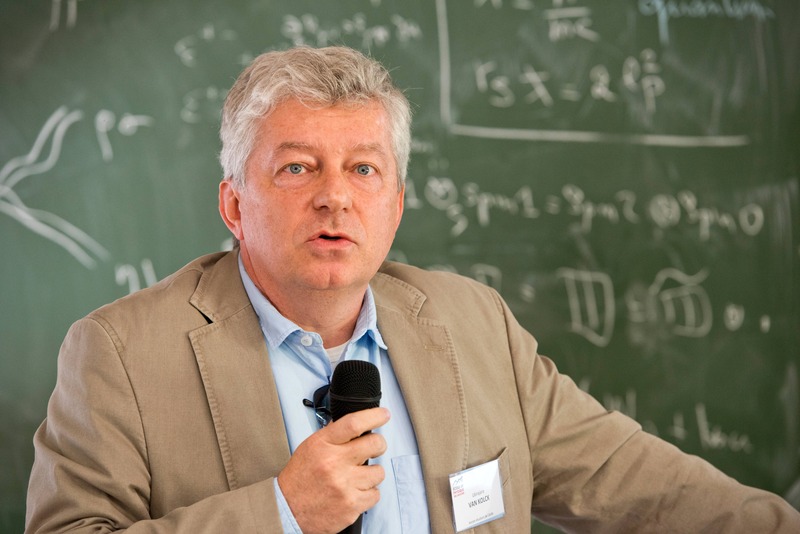 Among other service activities, I am Past-Chair of the APS Topical Group on Few-Body Systems and Multiparticle Dynamics and member of the editorial board of Progress in Particle and Nuclear Physics. The Nuclear Physics Group at UA hosted the DNP 2003 Fall Meeting in Tucson. In addition, we organize weekly seminars and an informal EFT pizza lunch (formerly a brown-bag lunch). If driving, you can reach the Physics and Atmospheric Sciences building at the UA campus from the Tucson International Airport or from I-10 by following directions and maps. For rides from and to the airport, Arizona Stagecoach offers convenient shuttle service. For nearby accomodation try a hotel such as the Sheraton Four Points and the Marriott, or a bed & breakfast such as the Sam Hughes Inn. See also the UA visitor information. My approach to teaching is described in my summary of teaching experience and philosophy. In particular, I strongly believe in research as a teaching aid. For example, I have worked with undergraduates in the UW Physics REU Program on the renormalization of singular potentials in quantum mechanics. In the Fall 11 I taught Nuclear Physics (PHYS 551), and before that PHYS 261H. Courses offered by the Department of Physics are described in the U of A Academic Catalogs. These and other professional activities I have been involved with are described in my CV (ps, pdf). But what I'm most proud of are my sweet girls. Laura is now an engineering student at the University of Washington, while Juliana, a former world-record weight lifter, works and lives with me in Tucson. My parents, Theodorus van Kolck and Odette Lourencao van Kolck, were psychologists, which perhaps explains something about me. The Lorenzon family comes from Negrisia in Ponte di Piave near Treviso. With the help Rob Timmermans, Ruud Cornelisse, and Paul Bonke, I have traced my branch of the Van Kolck family back to the 1500s in the Duffelt near Nijmegen.